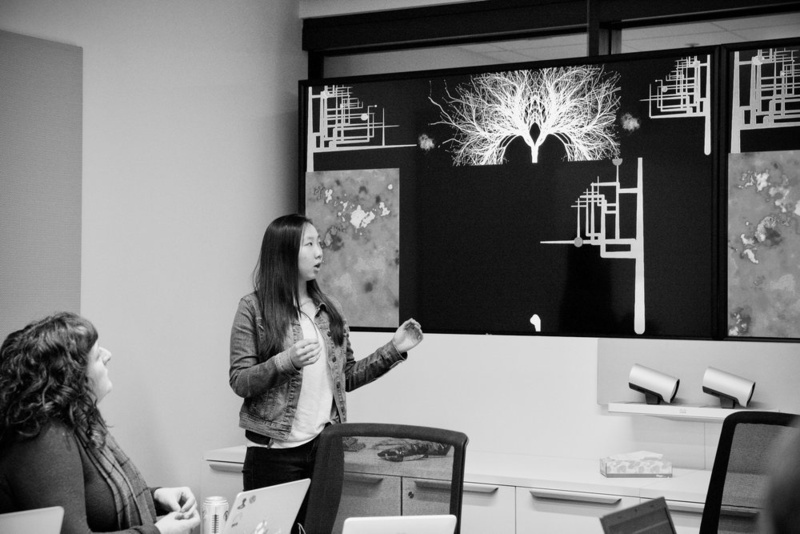 I was chosen to mentor, along with Niki Selken, a group of Six Bay Area girls (ages 15-18) who were awarded Creative Code Apprenticeships to develop an interactive artwork for the renowned Dolby Laboratories' Digital Ribbon Screen on Market Street. We created a generative code piece, entitled The Organic Mecanique. Using Processing and multi-channel audio, The Organic Mécanique explores the connections between cold mechanics and abstract nature, prompting a conversation about the cost of human innovation on the environment. The piece was made using Processing, Ableton, VDMX, we created a generative installation, and programmed sound design utilizing Dolby's Atmos System. The process involved classes/meetings twice a week for four months with myself, the other mentor and the girls. I presented the design iteration processes, gave the girls code challenges, and eventually we implemented the art in code. You can learn more about the process creating the piece on Medium. Apprentices: Omotara Oloye, Connie Liu, Grace Tan, Krystyna Olszewska, YahnaiJah Gilliam, and Erin Paige Woo.